Jethro Tull developed a mechanised seed drill. This made planting quicker and more efficient. Abraham Darby used coke instead of coal to smelt iron at his ironworks in Coalbrookdale, Shropshire. Thomas Newcomen developed the first functioning steam-powered engine. John Lombe opened a silk factory in Derby. The flying shuttle, that could weave mechanically, was developed by John Kay. It increased the rate of cloth production. Benjamin Huntsman discovered crucible steel-making. The first cotton mills opened in England. The Canal Act led to the construction of a network of canals in Britain. The Bridgewater canal opened enabling barges to take coal from Worsley to Manchester. The Spinning Jenny was invented by James Hargreaves. The machine made cotton spinning much quicker than when it was done by hand. James Watt improved the Newcomen steam engine. Josiah Wedgewood opened a pottery factory near Stoke-on-Trent in Staffordshire, England. Richard Arkwright developed a spinning machine powered by water. The Bridgewater Canal was extended to Liverpool. James Watt improved Newcomen’s steam engine. The network of canals now connected the Midlands to the ports of Bristol, Liverpool and Hull. The spinning mule was developed by Samuel Compton. This machine made it possible to quickly spin cotton and other fibres. James Watt invented the rotary steam engine which could be used to pump water out of a mine. 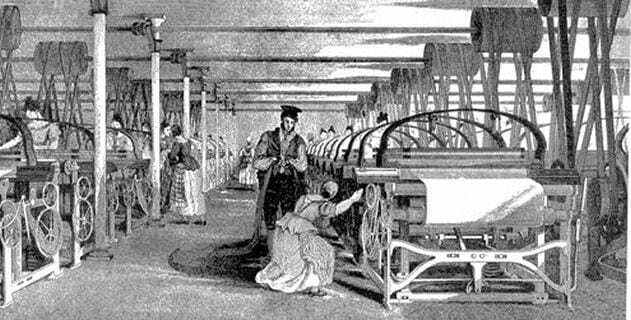 The first steam power loom was developed by Edmund Cartwright. This mechanised the textile industry. The Thames-Severn Canal linked London and Bristol. James Watt’s assistant, William Murdock developed coal gas lighting. The cotton gin, a machine that quickly separated cotton fibres from their seeds, was invented by Eli Whitney. The first industrial lathe was invented by Henry Maudslay. The Combination Acts made it illegal for workers in England to form unions. Robert Trevithick developed a steam locomotive. A battery that could provide electric power was designed by William Cruickshank. Robert Fulton developed the first successful steamboat. It was named Clermont. The Luddites, a labourer’s action group that were concerned that machines would take their jobs, began attacking factories breaking or damaging machines. In response to the Luddite Riots, parliament passed a law making the destruction of industrial machines punishable by the death penalty. Sir Humphrey Davy invented a safety lamp for miners that would give out light from a flame but would not ignite gases. The Cotton Factory Act banned children from under the age of nine years from working. Children aged nine to sixteen could only work for twelve hours a day. However the act was not enforced. Michael Faraday developed a motor using electro-magnetic energy. Charles Babbage developed a mechanical computing machine. The Stockton Darlington railway line opened in north-east England. It was the world’s first public steam railway. Marc Brunel began work on a tunnel under the river Thames. The Berkeley Ship Canal connected Sharpness to Gloucester. George Stephenson developed the Rocket, the first steam locomotive. The Liverpool and Manchester Railway began a commercial rail service. Canal building had increased and there were now 6500 km (4000 miles) of canals across Britain. Michael Faraday discovered electromagnetic induction which could power generators and electric engines. The Reform Act allowed the industrial cities of England to send representatives to parliament. The Factory Act regulated child labour in cotton mills. Children under the age of nine years were not allowed to work in textile factories, those aged nine to thirteen could only work nine hours a day and those from thirteen to eighteen could only work twelve hours per day. All children under the age of eleven had to have two hours education per day. Factory Inspectors were appointed to make sure the law was enforced. The Poor Law provided poorhouses for those who were homeless. Charles Babbage developed an analytic engine which could make calculations. The Great Western was the first steamship to cross the Atlantic. There was a total of 500 miles of railroad track in Britain. Louis Daguerre perfected Daguerrotype, the first photographic process. Fox Talbot developed photographic paper meaning that photographs could be printed. The Coal Mines Act prohibited women, girls and boys under the age of ten from working in mines. Mine Inspectors were appointed to enforce the law. Brunel’s SS Great Britain was the first large iron screw-propelled steamship. The Factory Act limited the hours of women and children under the age of eighteen to twelve hours on a weekday and nine hours on a Saturday. Children under the age of thirteen could only work for six and a half hours on weekdays and six hours on a Saturday. They also had to have three hours of education per day. Robert Thompson patented a pneumatic tyre. The Ten Hour Act reduced the working day of women and those under eighteen to ten hours a day with a maximum working week of fifty-eight hours. A Board of Health was established to investigate sanitation and ensure the provision of safe water. An outbreak of cholera in London killed around 10,000 people. The Ten Hour Act reduced the working day of all people to ten and a half hours a day during the week and only a half day on Saturday. Isaac Singer developed a practical sewing machine. The Great Exhibition opened in London. It was a exhibition of industrial development and progress. The Bessamer process for making steel was developed. William Perkin developed aniline dyes allowing more colourful cloth to be made. Isambard Kingdom Brunel’s ship, the Great Eastern was launched. The first internal combustion engine was developed by Etienne Lenoir. Edwin Drake successfully drilled for oil in Pennsylvania, USA. The Factory Act extended the regulations passed for textile factories to all factories. Brunel’s ship the Great Eastern laid telegraph cables across the Atlantic Ocean linking Britain and America. The Factory Act was extended to cover all workshops that employed more than fifty people. The Remington typewriter was developed by Christopher Sholes. The Public Health Act made the government responsible for ensuring safe housing and elimination of sewage. Thomas Edison improved the light bulb. The Education Act made it compulsory for all children under the age of ten years to attend school. Karl Benz developed the first automobile. Guglielmo Marconi invented the telegraph. The Factory Act raised the minimum work age to twelve years. Henry Ford opened the first mass production factory in the USA. The Education Act made it compulsory for all children up to the age of fourteen years to attend school.